Dr. John Summerskill is appointed seventh President, San Francisco State College. He is young, liberal, and has the reputation of being able to get along with faculty, administration and students. Sixty students sit in in Dr. Summerskill's office, protesting the college practice of providing students' academic standing to the selective service office. 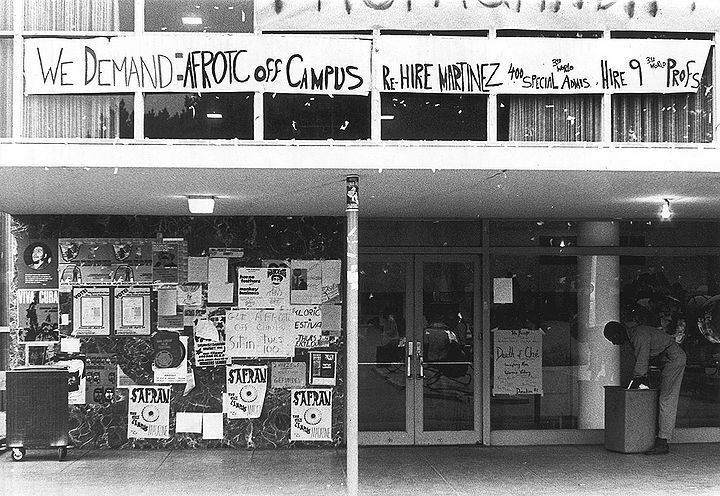 The on-campus cafeteria festooned with various messages, 1968. Students and faculty picket campus administrative offices to protest Chancellor Glenn Dumke's directive to the campus to continue supplying academic standing records to the selective service office. A "major corporation" (the Carnegie Corporation of New York) invites San Francisco State College to apply for funds to develop programs for teaching black history, art, and culture on campus. This information is divulged during a discussion of Black Student Union activities on campus in the Spring, 1967, semester. Several black students attack James Vaszko, editor of the Gator, the campus newspaper. Mr. Vaszko had stated in an editorial that he had written to the Carnegie Corporation asking them to cease any plans they might have had to grant money to the college's "service programs," which included Black Student Union sponsored programs. Six of the black students who attacked James Vaszko are booked on felony charges. The Black Students Union members hold a press conference and discuss their programs, which have been designed to awaken and develop black awareness and consciousness. San Francisco State College's Board of Appeals and Review holds closed hearing on the suspension of students accused of assaulting Vaszko. Sympathetic students picket outside. Dr. Summerskill appoints ten faculty members to a committee to investigate the causes of campus tension which resulted in the Vaszko attack. Two writers for the campus literary paper, Open Process, are suspended after publishing a poem which uses offensive language and contains sexual connotations. 450 students protest and attack Summerskill's "liberalism" and the Vietnam War. Students protest over suspension of the black students in the Vaszko incident and break into the administration building. Summerskill closes the campus rather than calling in the police. Dr. Walcott Beatty, Chairman of the Academic Senate, says that campus demonstrations and disturbances will not end because of the causes, including Vietnam and racial tension. He says, the campus is a microcosm of society." Dr. Summerskill hands in his resignation, effective in September, even though the Trustees of the California State College system have given him a vote of confidence. 300 high school and junior college minority students come to the campus to ask for waivers of admission requirements for the fall semester. Dean of Admissions Charles Stone says that he does not have power to grant waivers. Sociology professor Juan Martinez is influential in inviting the students. Black Panther Party Minister of Defense Bobby Seale speaks in the main auditorium at San Francisco State and tells the audience (mainly white students) that the only power blacks have is with a gun. The Third World Liberation Front (a coalition of the Black Students Union, the Latin American Students Organization, the Filipino-American Students Organization, and El Renacimiento, a Mexican-American student organization) occupies the YMCA office on campus, and moves YMCA staff out. Several San Francisco State College student leaders call on State Superintendent of Schools Max Rafferty to protest campus activities of the Black Students Union and the hiring by the student government of black playwright LeRoi Jones, who was a visiting professor in the Spring, 1968 semester. Summerskill tells the Third World Liberation Front to move out of the occupied offices. Professor Juan Martinez has not been re-hired for the following year, and this factor complicates the eviction process. 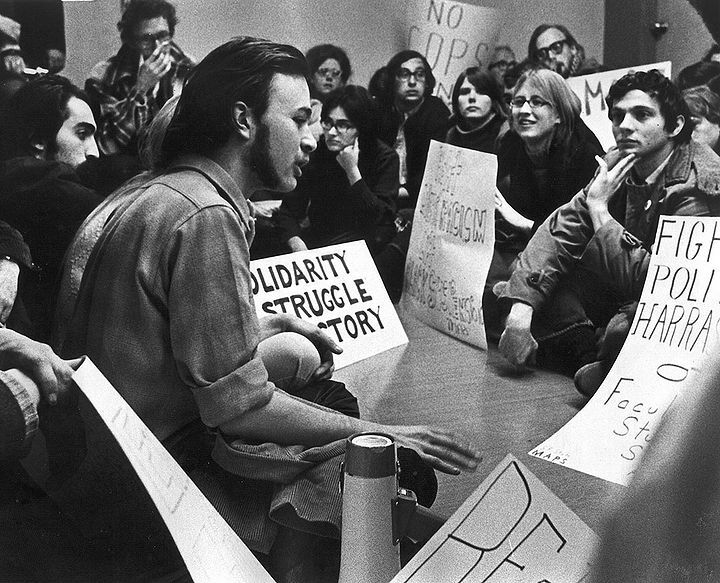 Sit-in on campus, May 1968. Students again protest for campus reform. Demonstrations are led by Students for a Democratic Society and the Third World Liberation Front. Chancellor Glenn Dumke asks Dr. Summerskill to resign immediately. Dr. Robert Smith becomes President, San Francisco State College. He is a professor of education. George Mason Murray is rehired as a teaching assistant. He was a graduate student in English, and was hired to teach special introductory English classes for 400 special students who were admitted to the college. President Robert Smith announces the creation of a Black Studies Department. Dr. Nathan Hare is named Acting Chair. California State College trustees vote to ask Dr. Smith to reassign Black Panther George Mason Murray to a non-teaching position. At a Fresno State College rally he allegedly had stated that, We are slaves and the only way to become free is to kill all the slave masters." At San Francisco State College he allegedly had said that black students should bring guns to campus to protect themselves from white racist administrators. President Smith refuses. Chancellor Dumke orders President Smith to suspend Murray temporarily. Chancellor Dumke orders President Smith to suspend Murray after Smith refuses to carry out the trustees' request. President Smith delays. The Black Students Union threatens a strike on November 6, and presents their 15 demands. 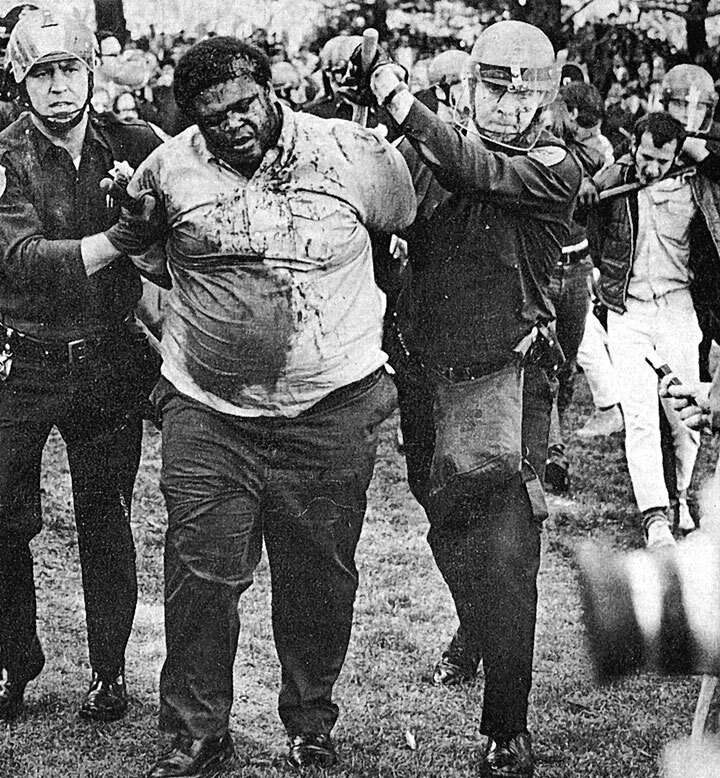 President Smith suspends George Murray. Student strike begins. 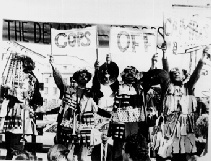 Strike is led by Black Students Union and Third World Liberation Front members, as a protest for a larger black studies program and for the reinstatement of George Murray. Most students attend classes. Police are called in after students march on the Administration Building. The campus is closed after a week of confrontations between students and police. During the week there has been widespread minor damage by striking students all over the campus. Some faculty members are considering striking. Police used surprising levels of violence in their unsuccessful effort to quell the strike. This is Don McAllister in custody after being severely beaten. At a faculty meeting in the Main Auditorium, Dr. S.I. Hayakawa, Professor of English, speaks on racism. He urges the faculty to support Dr. Smith. President Smith appeals to Dr. Dumke to reinstate George Murray. The Academic Senate debates the issues, and requests Chancellor Dumke's resignation. The faculty meets to consider the problems. Dr. Smith asks the faculty and administration to consider plans under which the campus could be reopened. Governor Ronald Reagan wants the campus reopened. The trustees order Dr. Smith to reopen the campus immediately. President Smith wants the students to return for discussion, not formal classes. A faculty grievance committee says that George Murray was suspended without due process. The faculty do not want to reopen the campus, but want to have a convocation to discuss the issues. Approximately 10% of the students return to campus for departmental discussions. Few classes are held. The convocation begins. Convocation continues. Black Student Union leaders confront the faculty panel and President Smith at the convocation. BSU leader Jerry Varnardo calls President Smith a 'pig,' and is booed by the audience. President Smith resigns. Dr. S.I. Hayakawa is named Acting President. His first official act is to close the campus. Campus is reopened. Sound truck incident occurs. Striking students position sound truck at corner of 19th and Holloway Avenues to urge other students to continue the strike. Hayakawa climbs on the truck and tries to disconnect the speakers. A crowd pulls his tam o'shanter from his head. He allegedly yells, You're fired! to noted author Kay Boyle, and she calls him 'Hayakawa Eichmann!" in return. Ronald Haughton, University of Michigan professor and labor arbitrator is called in to mediate the strike. Mayor Joseph Alioto has also organized a citizen's committee to help settle the strike. The campus American Federation of Teachers local seeks strike sanction from the San Francisco labor Council. More than 50 AFT members have set up an informational picket line around the campus, urging the trustees to negotiate with the students. School is closed for the Christmas holidays one week early. Campus offices remain open. Trustees meet with FT representatives to hear their grievances. Mayor Alioto's citizen's committee works on mediation efforts. Acting President Hayakawa bans meetings and gatherings on the central campus, says no unauthorized persons will be allowed to set foot on campus, and states that picketing must be limited to the perimeters of the campus. SF State Strike: Cops off Campus! Campus reopens. The San Francisco State College local of the American Federation of Teachers goes out on strike, and puts a picket line around the campus. About 350 teachers are involved. They wanted educational reform, removal of police from the campus, agreement to student demands, and a collective bargaining contract for the California State College teachers. Judge Edward O'Day of the San Francisco Superior Court orders the AFT teachers to call off their strike. The strike continues. Striking students, including some student library workers, initiate a "book-in" in the library. They take books off the shelves and bring them to the circulation desk, leaving them there in order to clog library operations. Acting President Hayakawa speaks before a Subcommittee of the House Education Committee concerning campus unrest. Judge Henry Rolph of San Francisco Superior Court orders the San Francisco State AFT local to end the strike. The strike continues. The San Francisco State APT local announces a tentative strike settlement. Black Studies Department Chair Nathan Hare and English instructor George Murray are not rehired for the following year. The strike continues. Timothy Peebles, San Francisco State freshman, sets off a bomb in the Creative Arts building at night. It explodes in his hands, and his hands and face are injured. 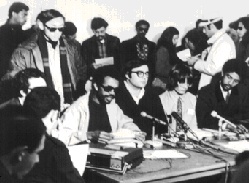 An agreement is signed between "representatives of the Third World Liberation Front, the Black Students Union, and the members of the Select Committee concerning the resolution of the fifteen demands and other issues arising from the student strike at San Francisco State College."